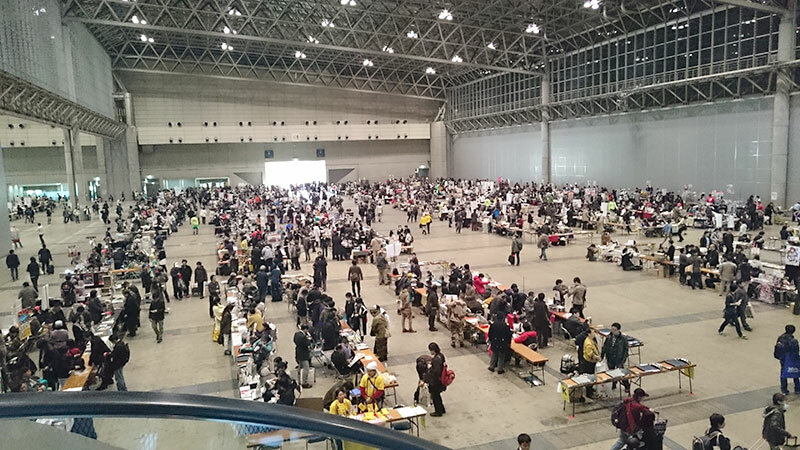 This past weekend, I participated in my first ever Comitia, a convention focused solely on original works — no established anime/manga characters allowed. 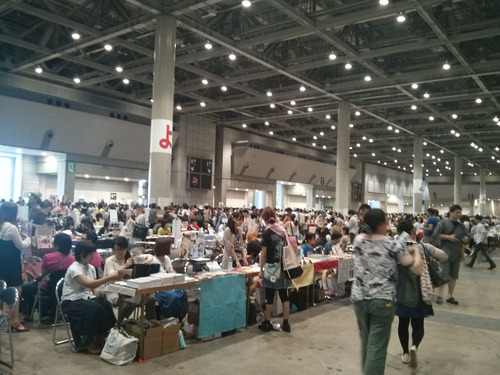 I’ve attended this event as a guest for over a year now, but this is the first time I actually got a table, bringing along my first-ever doujinshi/minicomic. As you can imagine, visiting and attending are a very different experience, each one rewarding in their own way. 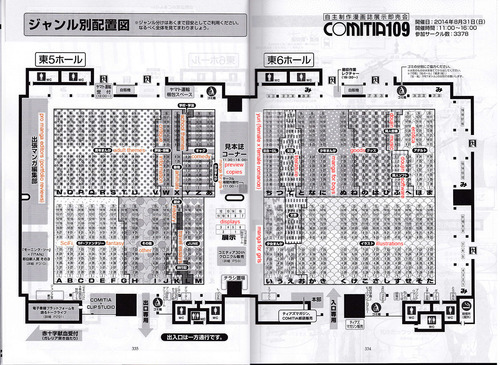 Registering for Comitia was incredibly easy. I had previously registered a circle at the circle.ms homepage, which serves as the registration platform for Comiket, Comitia, and several other events. The registration procedure was simple, requiring not much beyond name, address, genre and such. 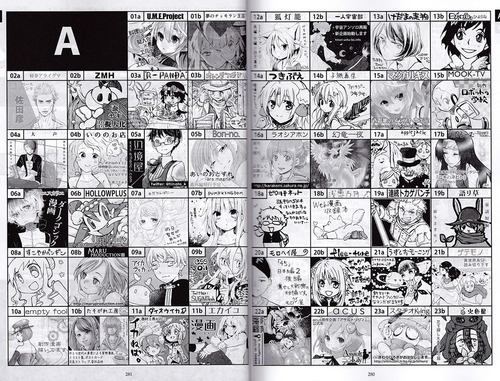 I had to submit a thumbnail for the catalog, for which the registration website provides templates. It was crazy cool to see my art in the catalog! Finally, the big day arrived on Sunday! 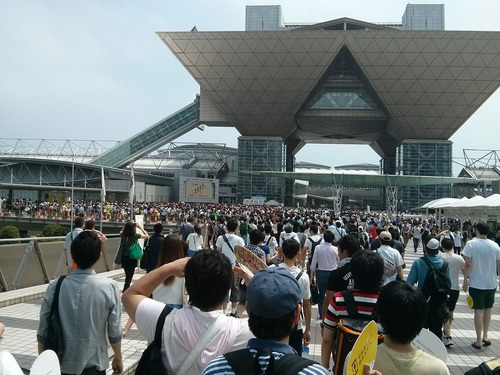 The line for Comitia is moderate. It only takes me a few minutes to get registered (a simple process of handing in the circle ticket that came in the mail, and receiving a different one for re-entry into the hall), and enter the hall. I reach my table. It’s the usual bare folding thing, with a pipe chair placed on top, and positively covered in promotional flyers. 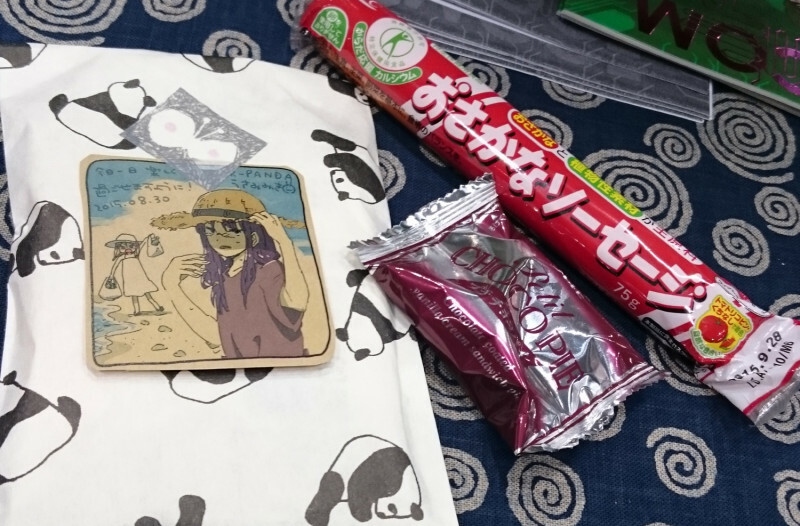 The promo goods also contains a large, sturdy paper bag from Tora no Ana, which turns out to be a godsend since the one I brought my equipment in (the big yellow promotional one from Dark Horse they handed out at SDCC) couldn’t handle the load and tore on the way in. 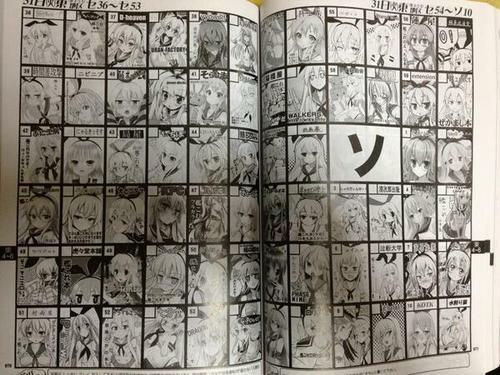 The “wandering registration” (巡回受付) begins. A friendly, bespectacled lady stops by my table, and collects my book sample and registration card. This completes the registration process. 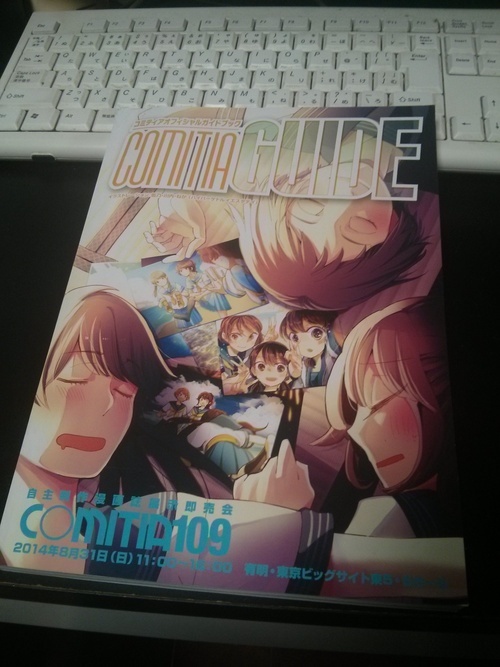 I am now officially a Comitia participant! I realize that I should have made my “menu” bigger, and brought more decorative stuff, as the table actually offers much more space than I had anticipated. 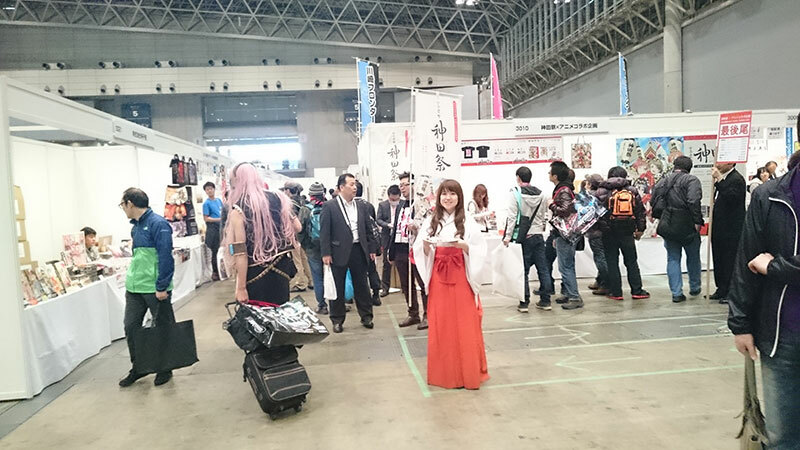 I’m still well within the norm of Comitia booth presentation, but I can do much better. I also decide to make the poster bigger (It’s A2, but I could’ve easily gotten away with A1 size), and find some cloth to wrap the little wire shelf in next time. The table next to me is a girl selling cute fantasy-themed illustrations, and has a guy helping her out. Two chairs make the 90cm wide space quite crowded. The person who reserved the space on my other side stays empty, giving me room for my bag. Circle admission ends, and we brace ourselves for the spectacle to begin. I make a quick run to say hi to friends like Torimura, Miki Usami, and recent acquaintance Ichigou. Doors open to the public. Applause. I see people streaming in from the main door, but they do not make their way into our aisle until quite a bit later. 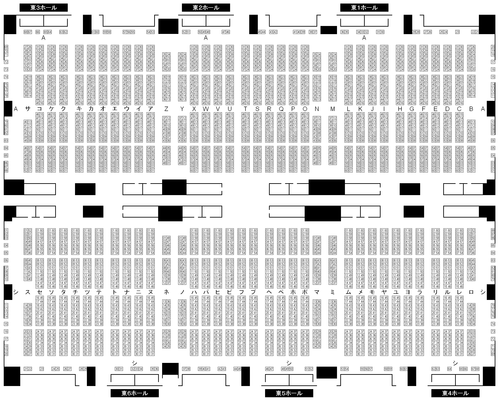 I assume a lot of them are heading towards the most popular circles first, which are located in the big aisles and have the most pull (=are the most likely to sell out). 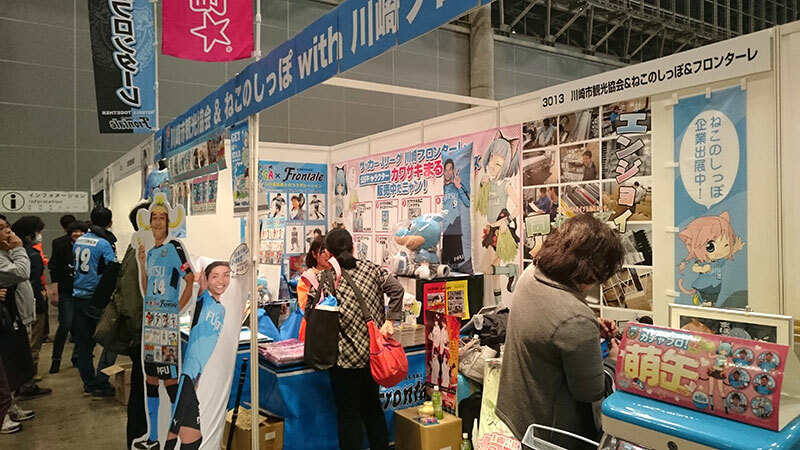 Usami stops by my booth and I wonder if she’s ok leaving her own table so early in the game (She does have someone helping). 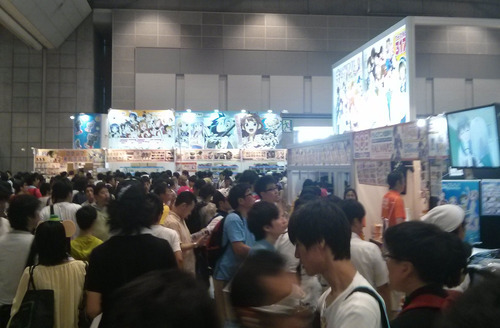 People start finding their way into the minor aisles. Most are headed somewhere, others are browsing cursorily, but nobody stops. My neighbor starts getting visits from established fans, and sketchbook requests (lots of artists in Japan accept requests, and spend a lot of their time during conventions drawing them). 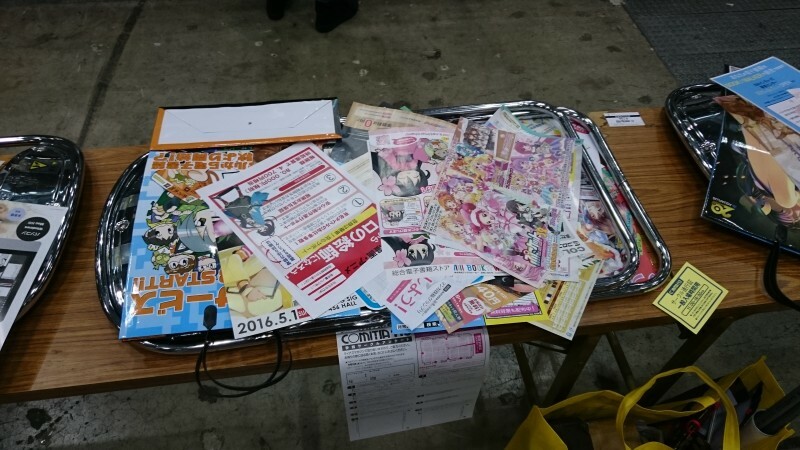 A lot of the fans have a clipboard where they note down which booths to visit, and where their sketchbooks are. My first sale! 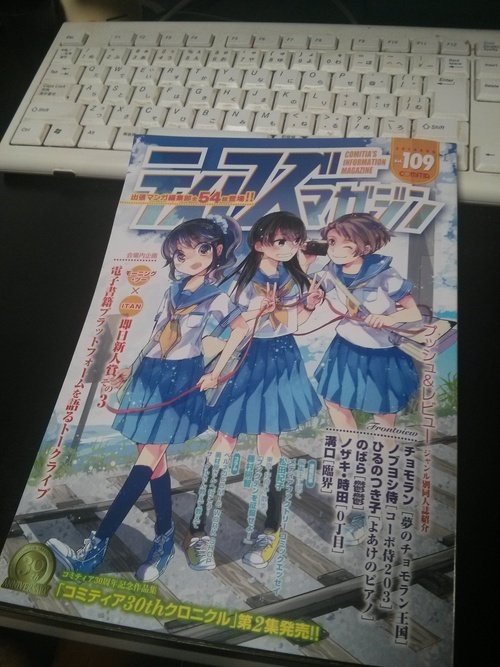 One of the readers liked it enough to buy. 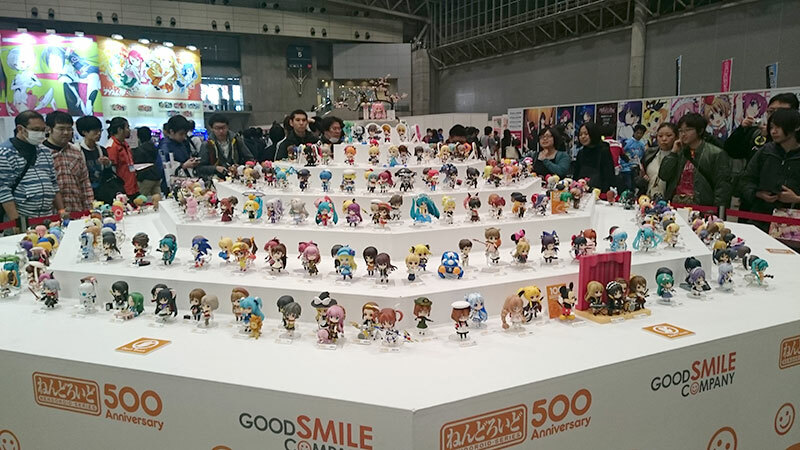 I remember telling someone I would be happy if even one person felt my work was good enough to spend 500 Yen on, and that holds true. I am pretty ecstatic. Shortly after, a woman zips straight to my table and asks for a copy. I wonder how she found me. Noticing a steady increase in traffic past noon. 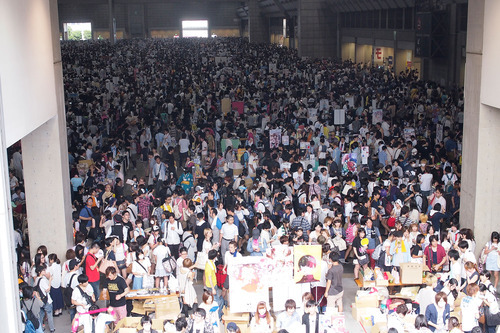 People are done getting the stuff they were actively looking for, and spending time just wandering the hall. A customer, after flipping through the book and checking out my menu, purchases the only Japanese/English set of the day. 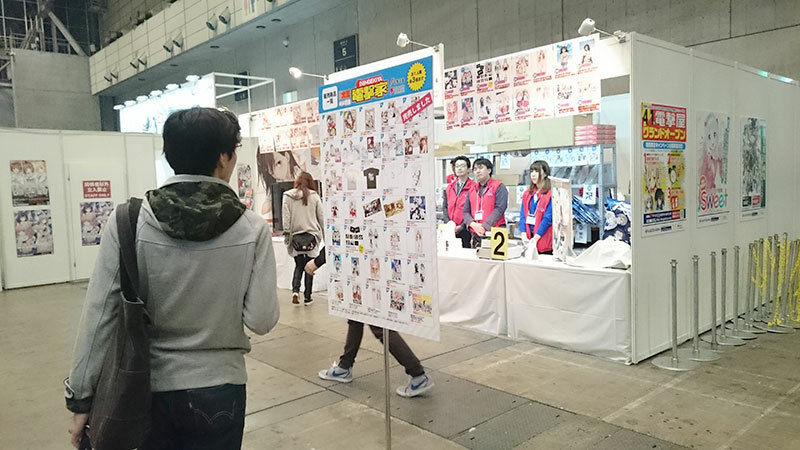 At some point I notice that Takeshi Miyazawa and Ken Niimura are only about 5 booths away and stare at their backs for a bit. The organizers announce that the catalogs (which double as tickets) have sold out, so anyone can enter the hall. I cannot tell if it has any effect on attendance. 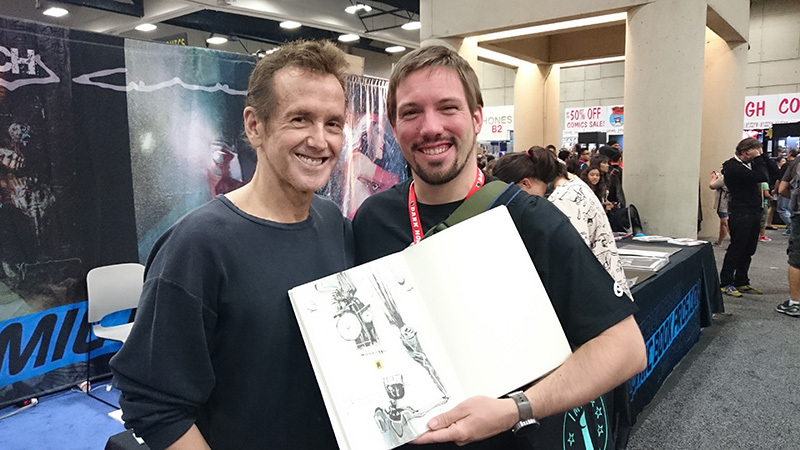 A dude in a Mad Max shirt picks up my SDCC comic, and I thank him with a V8 sign. 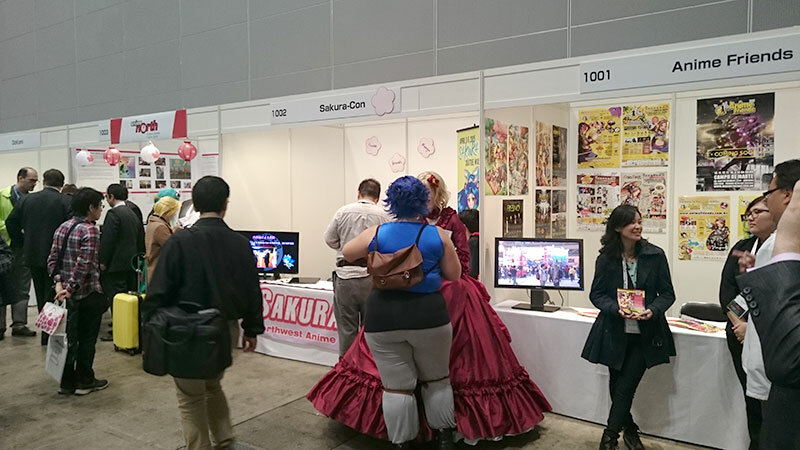 Mangaka and friend Tateo Retsu stops by and takes over the booth while I take a quick break. I get a fresh bottle of water and visit some friends I hadn’t gotten to in the morning. Attendees are getting visibly more tired, and harder to talk up. I stop by the editor’s outpost (a section of the hall exclusively devoted to pitch reviews by editors from roughly 100 publications. They look for pitch-ready sequentials rather than a portfolio of works). 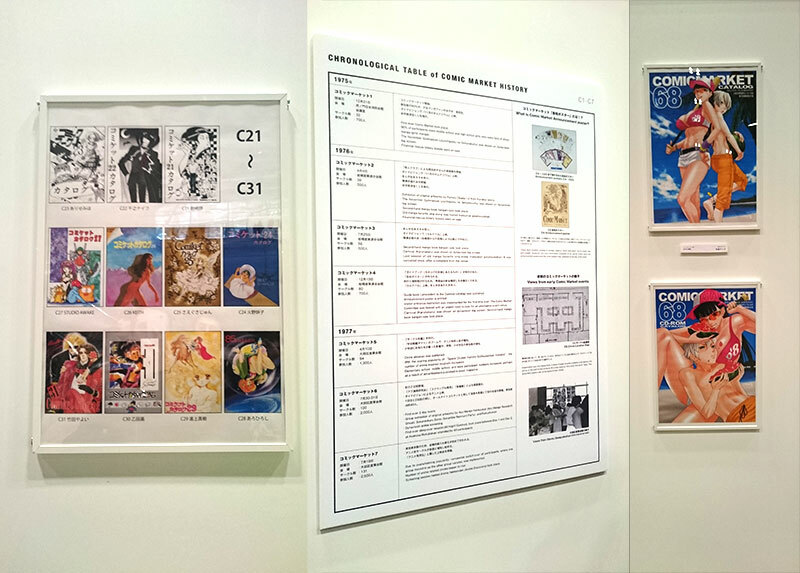 Beside this, there is a really interesting exhibit of scenario, roughs, and inks process from several published manga, including Saint Young Men (which is really funny). Back at the table, I chat with Tateo for a bit. She’s a cool lady, very knowledgeable about comics and the only person to notice my BPRD T-shirt. A girl stops by to pick up my SDCC comic. She’s really into Marvel movies and dying to go to comic-con. Hasn’t looked into the comics. I am at about 10 sales so far. Snacks friends brought to the table for me! More and more sellers are packing up and going home. The shipping agents getting really busy at the end is a factor in this. I have decided not to pack up until the closing announcement. Very few people looking at books anymore. The event is effectively over. The organizers announce the end of the event. Applause. I pack up my stuff (my box is noticeably emptier, but with the handful of books I bought or received from friends, it’s about the same), fold up the chair and put it below the table. 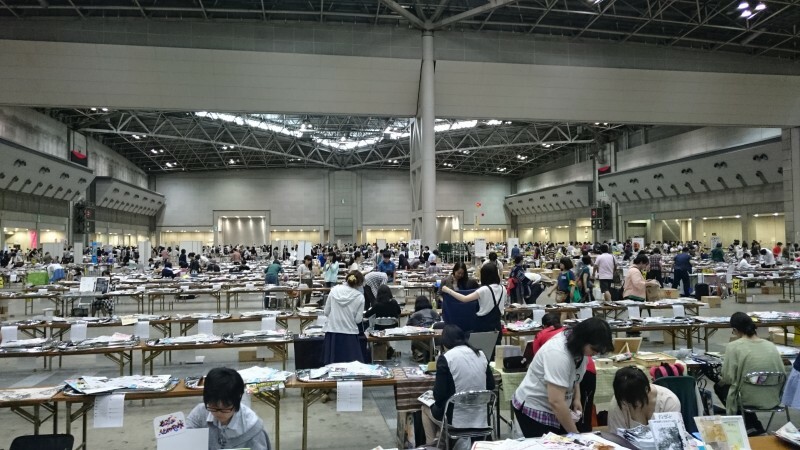 Folding up the table is optional but encouraged – at Comitia, sellers, just like attendees and organizers, are considered “participants” responsible for making sure the event goes smoothly. There are no guards shooing people out of the hall. Whoever remains is expected to help clean up, and the hall empties amazingly efficiently. Posted in events, SPIRE. 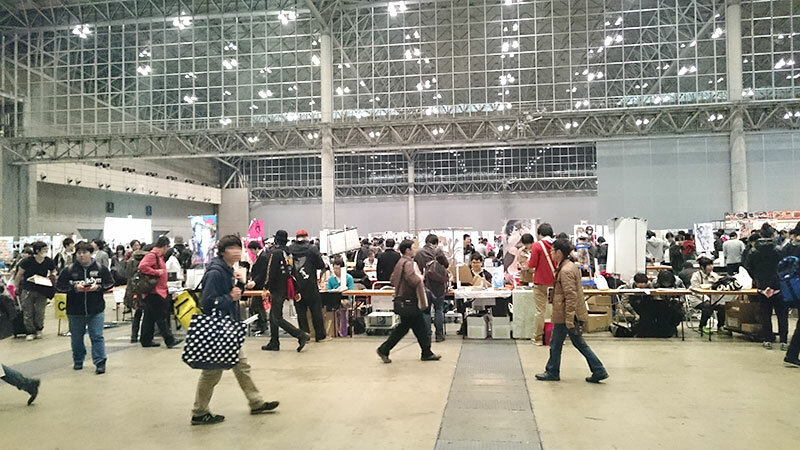 Tagged Art & Design, comics, Comitia, dojinshi, doujinshi, english, japan, TCOM. 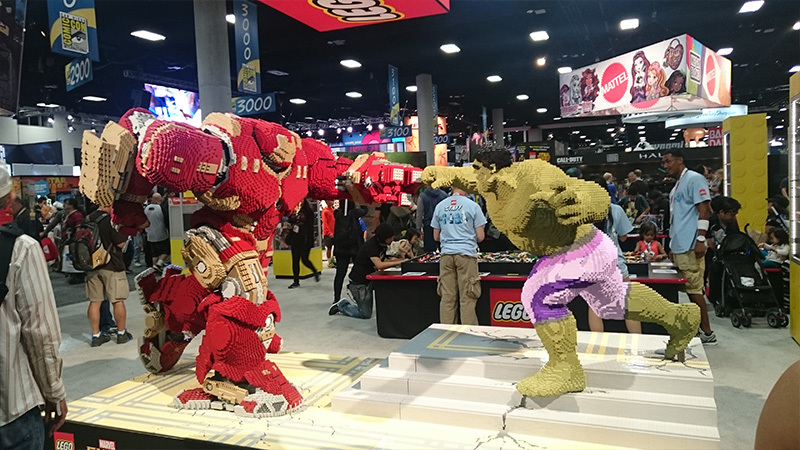 San Diego Comic-Con 2015! I’m back again, for the third time, after skipping last year’s. I haven’t written a con report since the Livejournal days, so I’ve been looking forward to this. This is a purely personal, journal-type post, so forgive me for being very self-indulgent! We had an exceptionally great flight into San Diego this year. Direct from Tokyo to San Diego, decent movies (I watched Chappie and The Secret Service, both of which I enjoyed quite a bit), fricking MOS burgers for breakfast! SAN was so much more convenient than LAX too, no line, no nothing. Smooth. We got into San Diego just around noon, so we had some extra time to walk around San Diego and get some sightseeing done! Funny thing, I never got around to doing that before. Comic-Con is always such a frantic blur, I never go outside the convention center/gaslamp/seaport area. 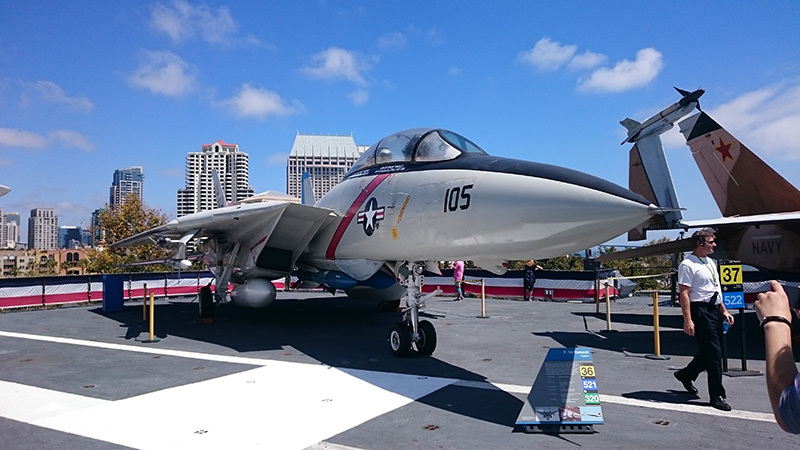 This year, we took that first afternoon and walked to the Midway museum! Maaan… This stuff just really gets me starry eyed. 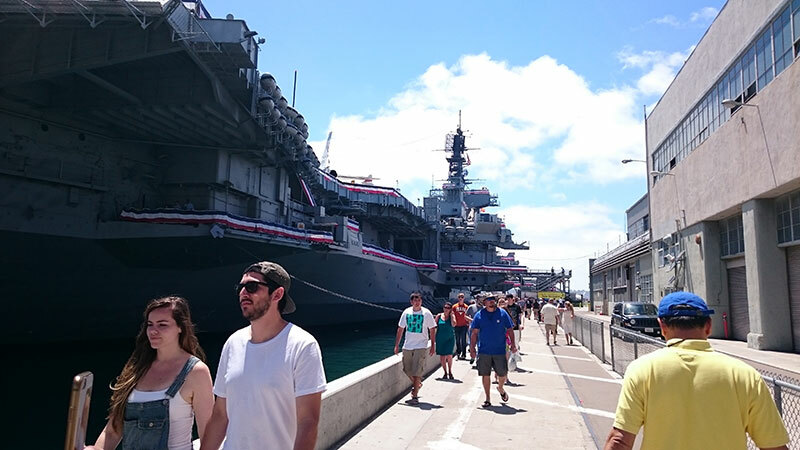 We spent about an hour and a half on the Midway, which felt much more like a building than a ship, because it’s so massive and solid. 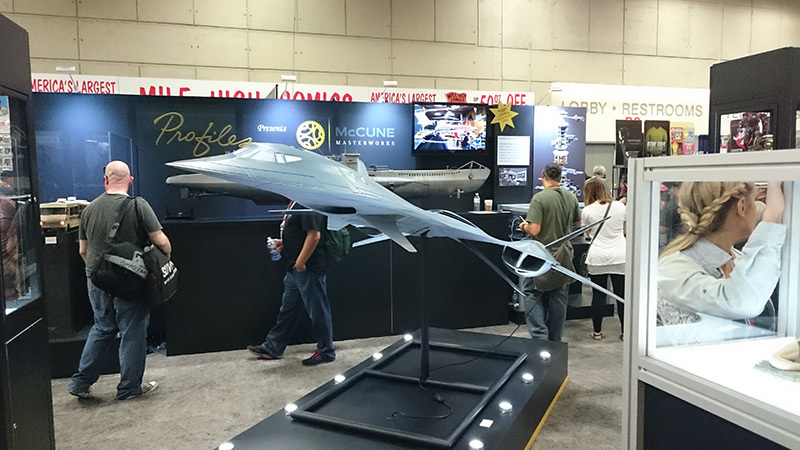 I distinctly remember gushing about how beautiful the rectangular jet intakes of that F-14 were. After a quick stop by the Cheesecake Factory, and some scrambling to get our badges from the person that had arranged for them, we were finally ready for the main event. Well, technically Preview Night, but even that’s not nearly the quaint, quiet time it used to be. 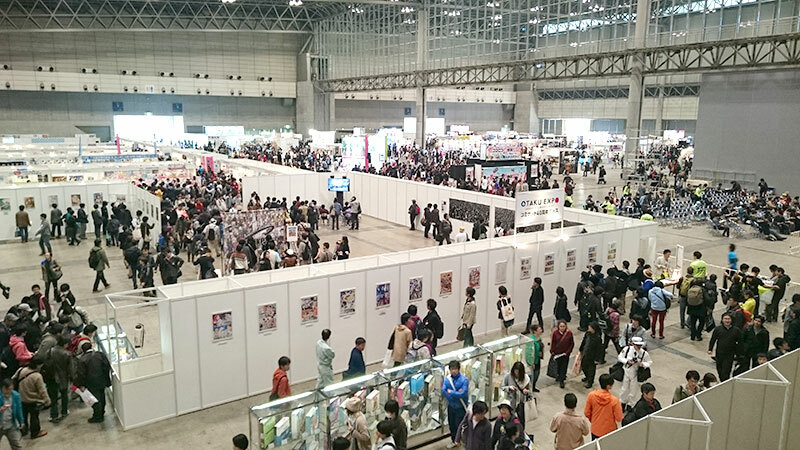 It was pandemonium right from the get go, and I chose to start slow by just strolling through artists’ alley (the quietest part of the exhibitor floor… which is awful if you think about it). I said hi to a whole bunch of artists, including Laura Martin, Dustin Nguyen, and Richard Friend (whose Youtube Channel I’ve been enjoying). I used to be really conscious about browsing at tables where I know I wouldn’t be purchasing anything, but recent conversations with artists have led me to change that — nowadays I’ll at least say hi and tell someone when I’m enjoying their work. The absolute highlight of preview night was when I was at David Mack’s booth, confessing that I had never read any of his work, and we talked a little about the books on his table — he had these amazing art books of his work on Kabuki — when Todd McFarlane walked up and just randomly joined the conversation. Viva Comic-Con (or viva Preview Night?)! Susan Heyward was totally checking me out. Anyway, Powers was fun. 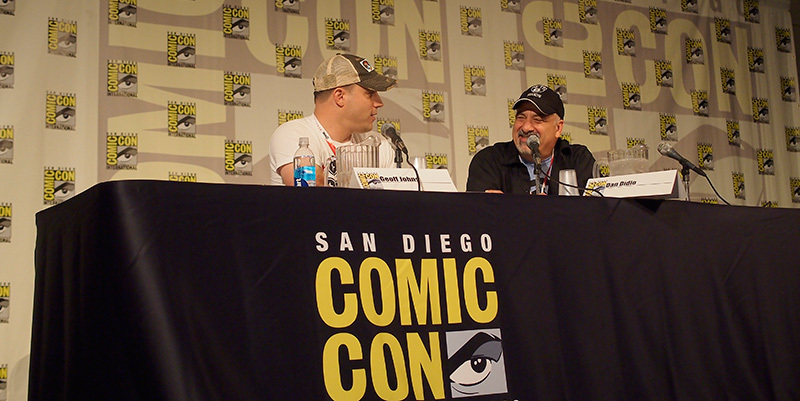 I’d met Bendis once at SDCC 2001, which I believe is when the series had just started, so it was cool to see him again (even if I didn’t get a chance to say hi). they didn’t have Sharlto Copley on stage, but honestly Susan Heyward is way cooler anyway, and they announced that one of my favourite characters from the comics — Supershock — was going to be in season 2. I’d lined up to ask a question (and get some free swag), but unfortunately too late to make the cut. 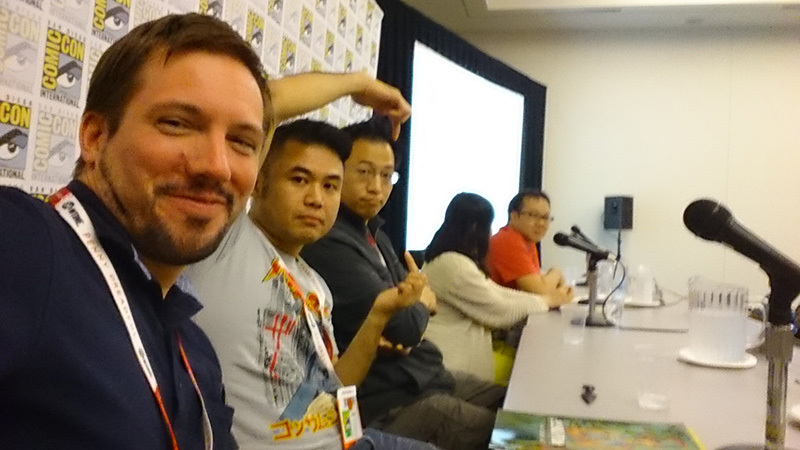 The Making a Living in Manga panel was a first for me: I was actually on stage for this one! 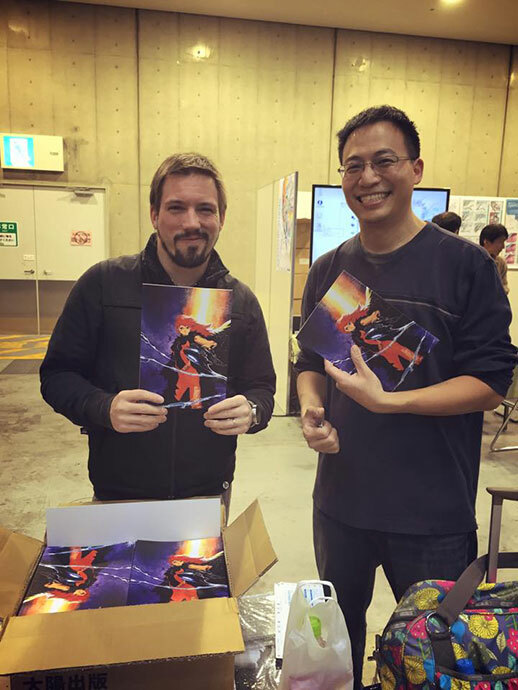 Deb Aoki had asked me along with my friends Makoto Nishi, Philip Tan, Akihide Yanagi, and manga artist Kamome Shirahama (who brought an amazing fan art book) and agent/translator Yukari Shiina to talk about our experiences with the manga industry in Japan. 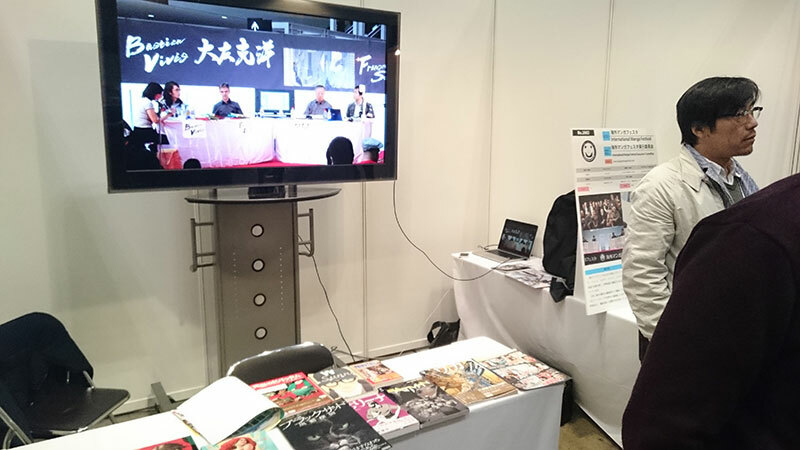 I interpreted for Makoto, and chipped in some of my experiences with doujinshi events and some random publishing facts. 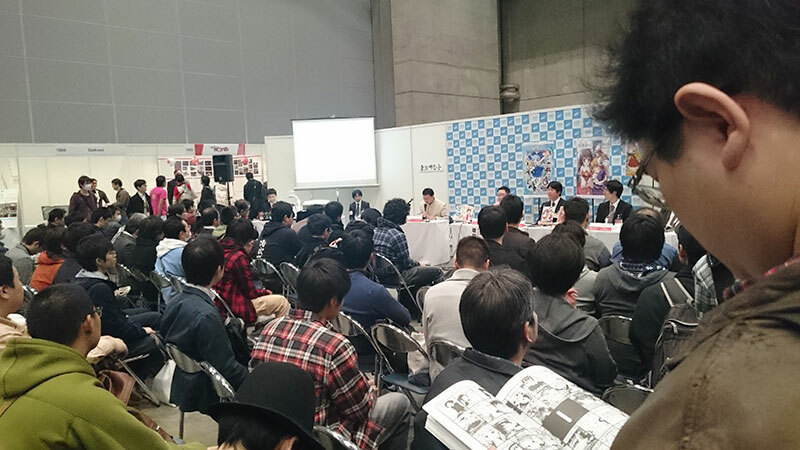 I feel we might’ve spent a little too much time on comiket and doujinshi, but apart from that I think it was a pretty balanced panel about the work of manga artists both Japanese and foreign, viewed from almost all possible angles. I’m hoping there will be a transcript or recording made available later on that I can share. After the Marvel panel, DC took over the room with the big Geoff Johns/Dan Didio one-on-one talk. 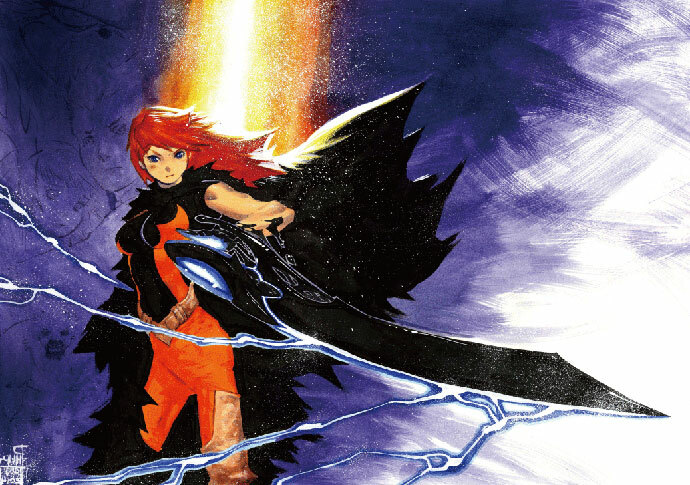 I don’t read a lot of DC these days, with exceptions such as Gotham Academy, but I did enjoy some of Johns’ stuff (Blackest Night), so I stuck around and watched it with my friend Sen (who should have a Shazam book at DC aaaaany day now). It actually turned out to be a really good time. Both of them, and Didio in particular, seemed like pretty cool dudes who cared a lot about what they’re creating. I’m glad I watched this panel, as I actually ended up meeting both of them again when we got the DC office tour on Tuesday. Didio mentioned he had been looking forward to this panel for years. And that was it with the panels for a bit, I spent the afternoon cruising the floor, but did manage to get a spot in line for a signing of the Batgirl team, who I think are all fantastic people, so it was great to meet them. The day was rounded out by a fantastic deep-dish pizza dinner with Philip, his wife, and his agent, after which we completely collapsed. REMINDER! @01FirstSecond is giving away galleys of The Nameless City TODAY at 11AM at their booth (#1323) at #SDCC! Hoo boy, would I have hated myself if I’d missed that. So that was my first order of the day! I got there half an hour early, there were already 10 people in line, but amazingly First Second was giving away 50 of the books. Which were actually properly bound, nice books, and given that this is one of my most looked-forward-to books of the year (2016!) I was suddenly extremely happy I’d attended SDCC! I can die happily now. My main order of the day, however, was a signing by illustrator legend Akiman (who created a lot of the classic Street Fighter II characters) at Udon. It was sort of my reimbursal for Udon getting me into the show. I had no idea what to expect, how much conversation there would be with the fans, etc, so I was super nervous. Luckily, Akiman and I have some friends in common (such as cosplayer Iiniku Ushijima, who accompanied him), so at least he knew who I was. It was an overwhelming experience — apparently 200 fans had lined up and purchased the $50+ limited edition book that served as the ticket to the signing. The line was so long we repeatedly got issues with security, and had to find ways to speed up the process. Hope the fans weren’t too inconvenienced, we did try to make as much time for everyone as possible. 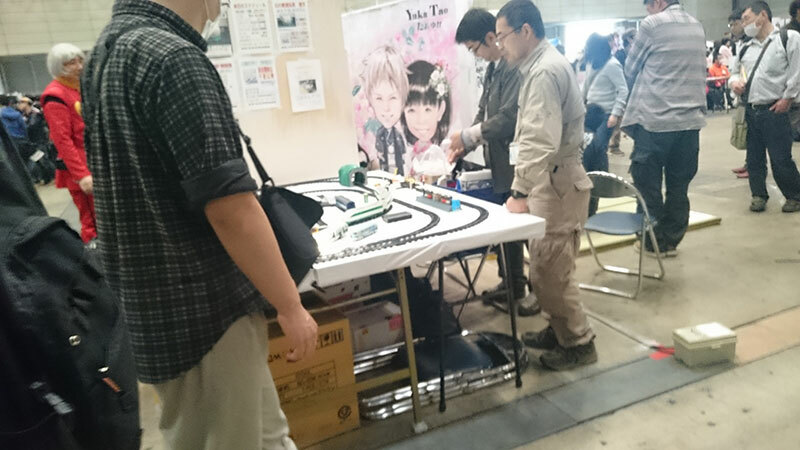 I think Akiman was thrilled to see the fans bringing vintage games or toys, and just the overall excitement about meeting him. 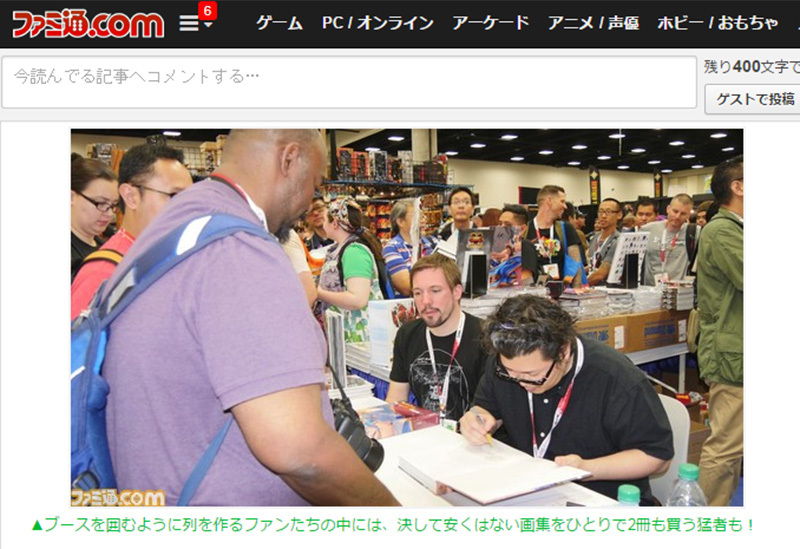 Weekly Famitsu had an article about the signing online, which was pretty cool! Fortunately, I found some other creators to take pictures with that day: Adam Warren, who was signing at the Udon booth, and was super cool to talk to (He gave me the honor of taking home one of my TCOM books! ), and Bengal, who was signing at the Magnetic Press booth. We’d been in contact about some unrelated stuff, so it was great to get to say hi! I got Bengal to draw me a Batgirl, so that was super cool. Also, I really regret not cutting my hair before the trip. Last but not least, I caught up with Christopher Butcher, who for the first time was not with us in the Udon booth, but had a corner of the Drawn & Quarterly booth — which also gave me some hands-on time with the Eisner Award they’d won for Showa! 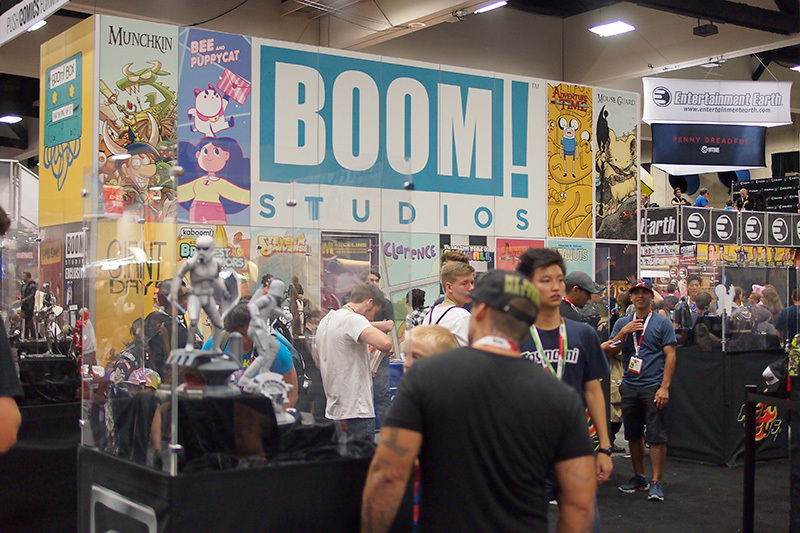 I also stopped by the BOOM! booth to pick up a The Spire variant cover (if you haven’t read it, you are seriously missing out. It is incredibly good), and congratulate one of the Lumberjanes creators (probably? I’d never met them before) on their many Eisners. I’ve only just started to read it (I always meant to! Also Nimona), but it’s bonkers and colorful and an absolute delight. Much like everyone else, I was getting a bit tired by Sunday. The crowds seemed even crazier than Saturday (last-minute shopping? ), so I took it slow and just wandered about for the most part. I hadn’t managed to meet up with old internet acquaintances Jamie McKelvie and Kieron Gillen, creators of the fantastic The Wicked + The Divine, so I decided to try and get into their signing, but barely an hour in Image was all out of tickets. They told me there might be a chance if I came back half an hour after the signing started, so I did… and there was a huuuge line. 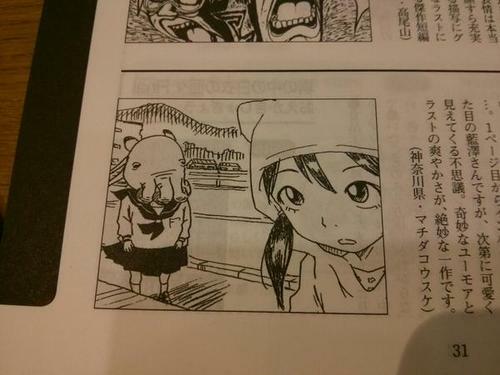 They hadn’t capped it, but after a while an Image employee came back to tell us we would have to give up because Kieron was up for a panel. About 5 of us (I’d befriended a store owner and a girl who’d started reading comics because of Jamie and Kieron’s work) decided to wait it out, and lo and behold: we got in! Aaaand that is why Kieron was late for the Image panel afterward, sorry guys! 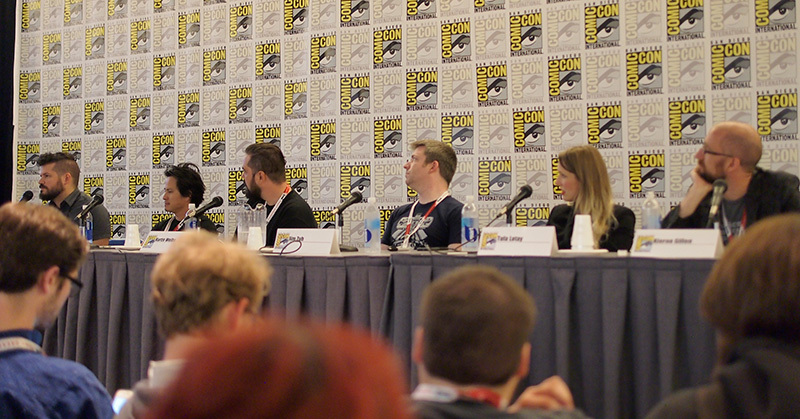 Said Image panel was the last thing I really did at Comic-Con. It featured a good selection of writers and artists whose work I enjoy — Ivan Brandon (Drifter), Dustin Nguyen (Descender), Kurtis Weibe (Rat Queens), Jim Zub (Wayward), Tula Lotay (Supreme: Blue Rose), and Kieron Gillen. Apart from stuff about their current projects, they talked about what what got them their first comics jobs (Tula started out as a convention organizer, and attending pros noticed her art online; Jim worked in animation and did a net comic that got noticed; Kurtis pitched to folks at comic-con and got rejected 50-60 times before landing a gig; Dustin carried samples around cons until a Wildstorm editor noticed him; Ivan was friends with Michael Oeming, who asked him to write a script for an idea he’d had), and adapting to working with different artists (Kieron: “I analyze the artist’s previous work to see what kind of script works for them — so for Tula, I basically just ripped off what Warren did on Supreme: Blue Rose” (slightly paraphrased)). Kieron mentioned some fun “soft connections” between WicDiv and Phonogram, which I definitely need to go back and find now. 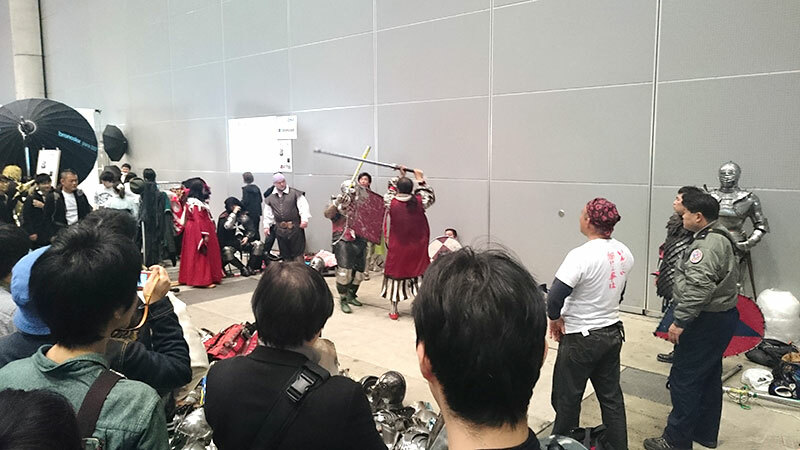 Some of the amazing cosplay! 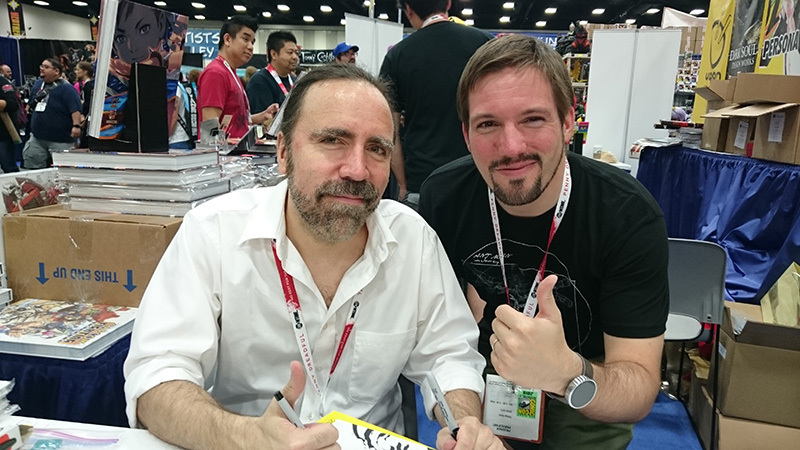 Given his professional status and price his art commands, I was expecting a haughty, cold welcome, but he turned out to be the nicest guy! Comics just never fail to surprise me with how nice pros are. I managed to lose a different sketch that had been wedged into the same sketchbook at his table, and Bill was so kind as to put it up on his facebook and twitter to try and find me… Another testament to what a nice guy he is! Fortunately, we still had the Udon “victory dinner” to look forward to, where we downed a metric tonne of Bucca di Beppo, and I had some more time to talk to Akiman and the other guys. A great time was had by all! 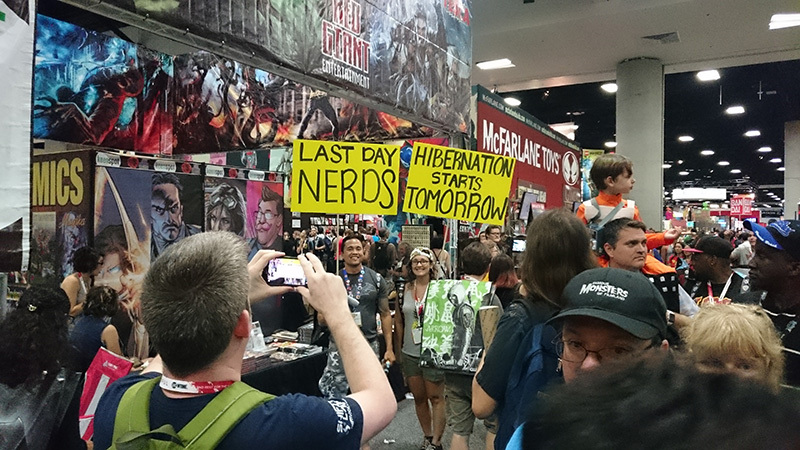 And that was my San Diego Comic-Con 2015. Much has been said about Comic-Con’s shift in content, about it not being the same anymore, etc, but yet again, even as someone purely there for the comics, I had the best of times. 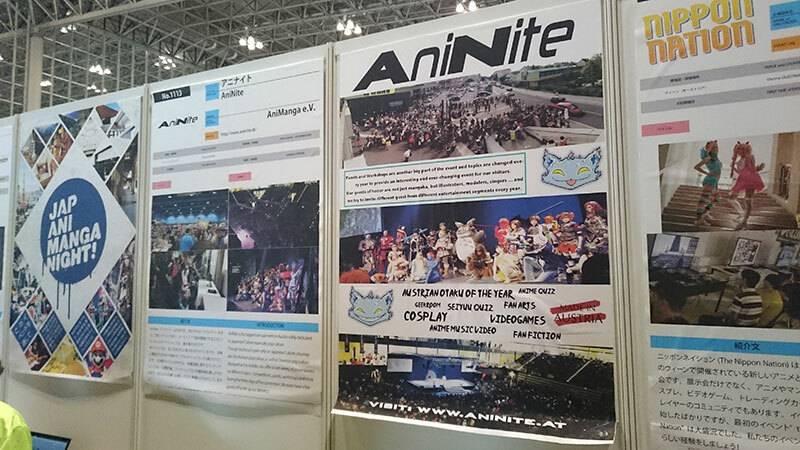 I was able to meet up with a lot of people, acquaintances both old and new, had a great time watching (and talking at!) panels, and even did a little shopping. It’s just a fantastic, crazy place to be in. I’m contemplating going to Emerald City Comic Con next year, which seems to get a super good rep from artists as well as fans.. But that’s all up in the air for now. 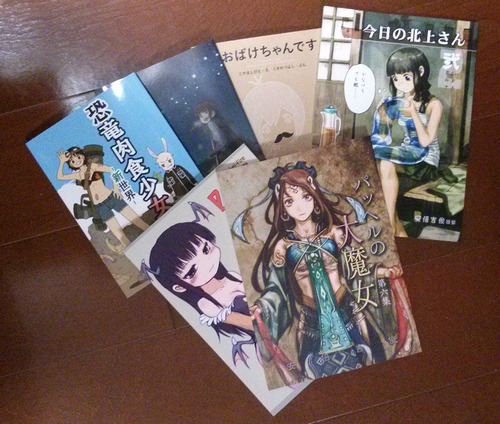 For now, I’m gearing up for next month’s Comiket and Comitia, where I will be selling my TCOM doujinshi! I have added some preview PDFs to my Making of post, make sure to check them out! 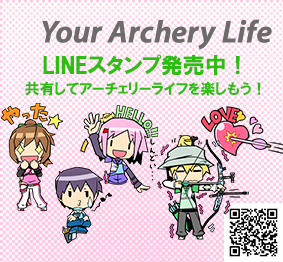 Posted in comics, events. Tagged art, Art & Design, comic-con, comics, english.